If you're like most English/Language Arts Teachers, you've probably thought about moving away from using daily journaling as a bell ringer / starter at least a time two. If, though, you're like I was, you might not know what other direction to take things. You want the activity to be routine oriented, while also being beneficial to students' study of reading, writing, and/or English. While the idea of a Word of the Day (W.o.D.) is far from an epiphany, the use of it to tie together out-of-context, test-prep-type words with the use of images has been a very strong experience in my own classroom. 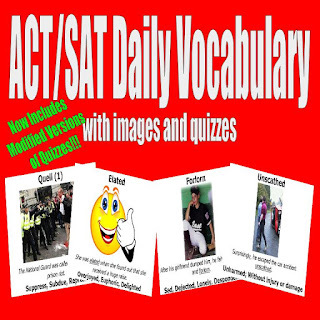 I've copied-and-pasted the description of the ACT / SAT Daily Vocabulary w/ Images, Quizzes, and Modifications below. While the bundle of daily vocabulary words with images, and quizzes with modifications might seem expensive ($10) at first, keep in mind that it takes care of all your daily bell ringers for just about 8 weeks, and it also includes two rounds of quizzes - both with modifications - to help assess student vocabulary retention. You can also check out the 16-week bundle with quizzes, and the 8-week bundle without quizzes in my TpT store, if one of those might better suit your needs. Thank you for your interest in this vocabulary bundle from A Teacher’s Teacher! As with all products that I develop, my goal is to make this product as teacher-friendly and student-beneficial as possible. I have been using a vocabulary approach very similar to this product in my own ninth and tenth grade classes for the last 6+ years, and I have found it to be a great success. Now, I’m making it available to you! For most weeks, there are five vocabulary words – one for each typical day of school. However, for some weeks, there are four words (and one has three words). This is the case due to planned days off, class meetings, teacher in-service dates, etc. that have affected my own classroom schedule in the past. I have left things that way because I know that other teacher face similar situations, and you can move charts around to specific weeks to meet such needs. With the exception of when there are vocabulary quizzes (and information from weeks 1-6, for example, are covered), the order of the weeks does not need to be strictly followed. If you chose to not purchase the package with vocabulary assessments, then you can use the charts in any order you see fit. I use these vocabulary words as a “bell ringer” style activity. You don’t have to use this approach, but I have found that, with the amount of writing that I do in class already, journaling or “daily starters” weren’t necessary. The first thing that students do at the beginning of the week is get a chart. I place them on a table/desk for students to pick up as they enter, but you can pass it out, if you’d prefer to do so. Students know once they come into the room that the word, a sentence using that word, and an accompanying picture that helps communicate the word’s meaning will all be projected on the board. Of course, you could make it available on your webpage if you are a one-to-one-device school, or you could write the sentence on the board and draw a picture of your own, if you are so artistically inclined. Students know when the bell rings, if not before, to write down the sentence for the daily word, doing so exactly as it is given to them (including underlining the vocabulary word in the sentence). After writing the sentence, students write their context-clue guess in the “top” portion of the definition box – this is a key step, as students are required each day to work with a vocabulary word that they likely have not mastered. After giving students about two minutes to copy the sentence and make their guess, I take volunteers or call on random students to share their guesses, followed by displaying the correct definition/synonym(s) (on the PowerPoint shows, this is done through an animation when you push the down arrow or the space bar. Students, then, write the definitions/synonym(s) given in the “bottom” portion of the definition box – making sure to write it out in its entirety. Lastly, students draw their own picture, or write their own mnemonic device (including root words, similar words, etc. ), to help them remember the word’s meaning. Like all the other portions, I have found this part very important, and I even did a classroom research paper about the use of images in learning vocabulary (hence the image on the slideshow, as well).After doing this process each day, students turn in their work at the end of the week, or after doing all the words on the chart. For weeks that you don’t have a “full” set of words (i.e. one for each day), you can always have students do supplemental work on the “back” of the chart sheet, such as writing their own sentences for 2 or 3 of the words or commenting on how they best remember the words. While most weeks will work with the routine above, the weeks when there are vocabulary assessments are designated for reviewing the vocabulary. Those weeks will have charts that have fill-in-the-blank sentences with multiple options to choose from. Since the vocabulary words for the quizzes are cumulative (meaning the list for the quizzes just continues to build each week – making learning, and not just cramming, important), these review sentences help students prepare for their quiz. I always give students a list of the vocabulary words that could be on the assessment at the beginning of these weeks, using a list generated by the site Quizlet, explained below. The site that I have found most helpful in giving my students a resource for studying. The site (quizlet.com) allows you to create a free account and then create as many vocabulary lists as you’d like. For mine, I simply type the word in and then copy/paste the definition from the weekly slideshows. Doing so at the beginning or end of each week, so students can continuously study (instead of just waiting until the week of the assessment), takes about 3 or 4 minutes, including the time to log in and get to the list you need to update. You can then share the link to your vocabulary list, or give it a unique-enough name that students can “search” and find the list to study. Students can study on desktops, laptops, tablets, and phones. In fact, Quizlet makes both an Android and iOS (Apple) app for phones and similar devices, and the app (at the time of this being written) is free! All assessments in this vocabulary bundle follow the same format. There are first multiple-choice questions, some with paragraph or sentence context, which require students to choose the correct answer. The second portion of the quiz requires students to fill-in-the-blank, choosing options from a word bank, similar to the sentences during review weeks building up to the assessment. All of these assessments have keys that are provided for your convenience. Until next time, keep teaching your students with all the passion that I know you bring to each and every day in the classroom (or at least get rejuvenated and ready for the fall - it is always here before we know it)!